Last night I started sewing a School Photo Dress for Isabel. Now, I know the old saying: Pics or it didn't happen! But I'll leave this as a teaser for later tonight. I will share these though. 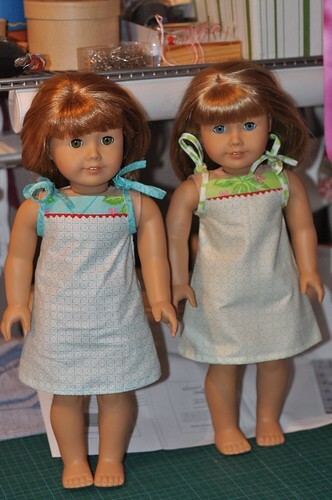 Popover Sundresses for the girls' dollies. I used my Oh-Cherry-Oh Layer Cake and Charm Pack to make them. One layer cake piece fit one dress panel, so in total 4 layer cake pieces (2 for the dress panels and 2 for the bias tape) and one charm square to make one dress. These was even leftovers to make an apron or a head scarf.